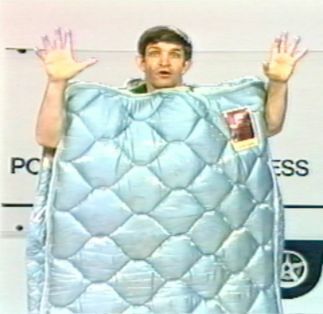 Born in Mississippi, Jim “Mattress Mack” McIngvale attended high school in Dallas, and he was a student at the University of Texas and the University of North Texas, where he played football for both schools in 1969-1970 and 1972-1973, respectively. After college, Mack worked at a convenience store where his boss did him a huge favor one day: firing young Mack. Refreshed and determined to make a name for himself, Mack found a job at a furniture store on the other side of town where he diligently worked, absorbing the business practices and trades of the furniture industry. Inspired, Mack made a decision that would forever change his life and the competitive world of retail industry: to open up his own furniture store. Mack’s brother George worked in real estate and found the perfect location to start his new business: an abandoned model home park located at 6006 I-45 North Freeway in Houston. Mack asked his then-girlfriend Linda to join him in Houston, and she said she would move under one condition: if they became husband and wife. 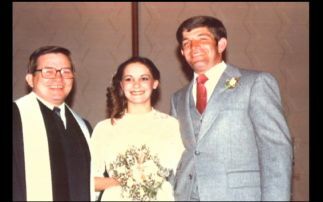 The newlyweds arrived in Houston in 1981 with $5,000 and a dream. 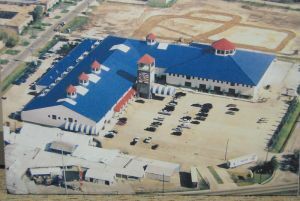 Mack’s new business venture began in an abandoned, un-heated/un-air conditioned model home park that was formerly occupied by a build-on-your-own-lot home building company. That same year, Houston experienced a great wave of migration to the city from families all over the country, thanks in part to a boom in the auto, oil, and steel industries in the area. Perfect for Mack, these families needed furniture to fill their new homes, and the newly opened Gallery Furniture primarily sold value-priced furniture targeted towards blue-collar workers. Any profit the store received, Mack would reinvest and put back into his store by purchasing more furniture. Despite this initial success, sales began to decline. During this dramatic halt in sales, Mack took the time to re-evaluate his advertising strategy, which consisted of nailed signs to telephone poles and door-to-door flyers. With his last $10,000, Mack revamped his advertising plan by purchasing television advertisement time. He bought advertisement time on two different networks, where his commercials would loop with announcements for trade schools and worker’s compensation lawyers during Saturday night wrestling broadcasts. After a long day at Gallery Furniture, Mack stopped by the television station to view the progress of his commercial production. Not liking what he saw, he stepped in at the last minute and improvised where he rapidly spoke, announcing the business practices of Gallery Furniture and ending his pitch with the now-famous “Save You Money” slogan. The ad hoc campaign worked, and Gallery Furniture experienced huge shifts in sales. 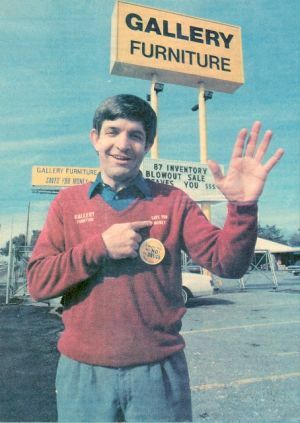 Mack started branching away from selling only value-priced furniture to include higher-end furniture, attracting a new set of customers to his store. But Mack kept the same promise to all his customers: if you buy it TODAY, we’ll deliver it TODAY. Appreciative of his business’s success, Mack is extremely grateful to the city of Houston. Just as he’s known for his catchy slogan, Mack is equally known for his generous support to various local charities. Every Christmas, Mack donates households of furniture to needy families. Mack is often the high bidder for the Houston Livestock Show and Rodeo, where his contributions go directly towards college scholarships. He is also a proud supporter of the city of Houston, going as far as to attend the 1996 Summer Olympics in Atlanta to campaign for Houston’s bid for the 2008 games and spending his own money for the cause. Mack donated money to the Bush-Clinton Tsunami Relief Fund, and in 2009, Gallery Furniture committed to providing new furniture to various USO centers around the world. On a regular basis, Mack participates in speaking engagements for various groups, including schools, where he shares his fascinating story with eager listeners. Open daily from 8 a.m. to 10 p.m., Gallery Furniture seems to never stop, just like its owner. Mack works seven days a week, standing at his desk by the entrance to greet his customers. Like his trademark commercials, Mack can be heard regularly on the store’s loudspeakers, announcing the latest deals and specials. With such high standards for himself and his store, Mack likewise expects only the best from his employees, all in an effort to provide superior service to his customers. When new shipments arrive, Mack often joins his staff, lifting and lugging the furniture around the store. Stemming away from the typical and boring furniture shopping experience, Mack has made a commitment to provide customers with an energetic and pleasant shopping experience. On a typical weekend, customers can expect chocolate cake, coffee, fresh-squeezed lemonade, and warm cookies. Additionally, Mack and his employees gather together to sing “The Star-Spangled Banner” and “God Bless America” to show goodwill towards the troops overseas. Exotic animals have now become a fixture in the Gallery Furniture landscape. For years, parrots have been perched by the fountain, where they can be heard shrilling from anywhere in the store. Several monkeys are found in the centrally located cage, ready to excite customers of all ages. Interesting personal possessions throughout the store are a testament to Mack’s legacy, such as personalized photographs with athletes, presidents, and other celebrities. Mack expanded Gallery Furniture in early 2009 by opening a smaller-scale version of his main store in the Galleria area, and Gallery's newest store at 7227 West Grand Parkway, serving western Houston bedroom communities, is an impressive new landmark for the area. As Mack and Gallery Furniture move forward with new and exciting projects, some things will never change, like his utmost commitment to his customers, employees, and community.